For more decoration ideas, menus and party games, see our fun Valentine's Day Party Ideas! Customize your celebration with our personalized invites and great favors! 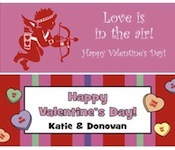 One of the easiest ways to decorate your party is with Valentine's Day and heart themed supplies. 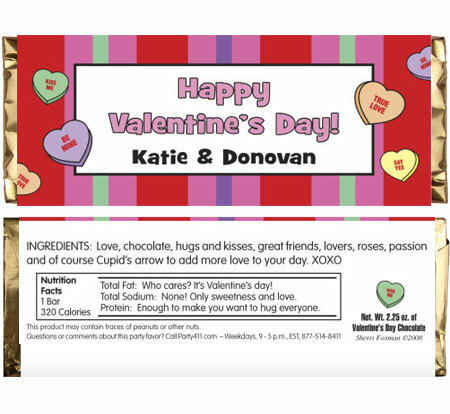 Buy several packs of those cheesy Valentines that kids swap in class. Use a hole punch and some red ribbon to make a garland. It will look festive hanging over the party entrance or above the buffet. For cute and easy table decorations, scatter conversation hearts or red hots as confetti. Fluff the napkins and pull them through a Red Glow Bracelet as a napkin ring and a favor!